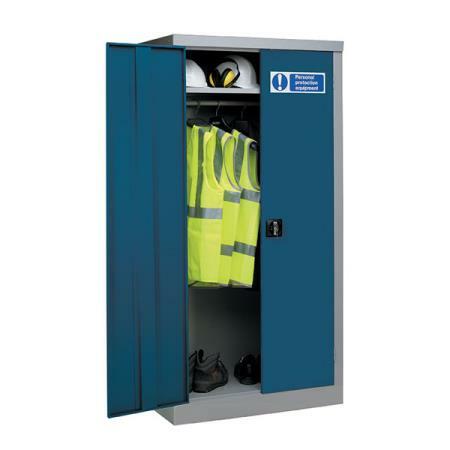 PPE equipment cupboards are mandatory in many working environments as they enable the safe and separate storage of protective equipment and clothing, preventing equipment loss or damage. Available with blue doors, silver carcass, appropriate PPE signage and anti bacterial paint finish as standard. Other types of storage cabinets such as large volume cabinets or security cupboards are suitable for PPE purposes if ordered with a blue paint finish. Please contact us for further help and information and we will be pleased to provide the appropriate PPE signage.